The lines and patterns on a barcode are actually representations of numbers and data and their development allowed basic information about a product to be easily read by an optical scanning device (a barcode scanner) and automatically entered into a computer system. This massively reduces the time to record products information and eliminates human data entry error. Barcode systems help businesses and organizations track products, prices, and stock levels for centralised management in a computer software system allowing for incredible increases in productivity and efficiency. Barcodes started out with simple 1-dimensional designs, consisting of basic black lines that could only be read by specially designed barcode scanners. However, today barcodes come in many shapes and sizes and a wide range of designs and many can even be read by mobile phones and other devices. Provides unambiguous & universal identification of products so no two products in the world would have the same GS1 barcode number. Helps with faster listing of products on e-commerce platforms. Meets pre-requisite to doing business with modern trade retailers. Gives an international look and feel to products..
Facilitates accurate and faster billing at retail billing counters. Since the barcode is a unique key to identify a product (via GTIN), it can be used to identify products without any ambiguity and place accurate orders for them. With Product Barcodes, company can use the technology to maintain accurate control over inventory. For example, warehouses and retailers can scan barcodes when products arrive and leave, to take a record of inventory. Some companies link their inventory control to online portals so that they can instantly update package status. Enables automated data capture with 100% information accuracy. This helps eliminate human errors, offering a reliable way to read encoded information. First, Get Consultation from our Consultant to know the Documents Requirements, Registration Cost, Subscription, Barcodes type, Numbers of Barcodes and process of registration. Once your documents reached to us, We prepare your application along with the “Product Sheet". you can take more than one barcode in one application subject to maximum limit as per option availed by you. Maximum Barcode limit is 100000. Once your application is completed in all respect, we proceed to file your application with GS1 India and Pay Fees. GS1 India, Issue Certificate for all Barcodes. BARCODES REGISTRATION COST DEPENDS ON TURNOVER OF THE APPLICANT COMPANY, NUMBER OF BARCODES OPTED AND PERIOD OF SUBSCRIPTION. *MSME registered Entity in India can enjoy a subsidy of upto 75% of cost of obtaining barcode in India. *The above fees last updated as on 31st March 2018. Our Professional Service Fees is over and above Registration cost. What are the Different types of Barcodes ? EAN/UPC (European Article Number/Uniform Product Code) Family of barcodes is instantly-recognizable barcodes that are printed on virtually every consumer product in the world. They are the longest-established and most widely-used of all barcodes. Used for Retail stores for sales checkout; inventory, etc. DataBar barcodes are often used to label fresh foods. These barcodes can hold information like an item’s batch number or expiry date, in addition to other attributes used at the point-of-sale such the item weight. 128 and ITF-14 are highly versatile 1D barcodes that enable items to be tracked through global supply chains. The 128 barcode can carry any of the ID keys, plus information like serial numbers, expiration dates and more. The ITF-14 barcode can only hold the Global Trade Item Number (GTIN) and is suitable for printing on corrugated materials. Two-dimensional (2D) barcodes look like squares or rectangles that contain many small, individual dots. A single 2D barcode can hold a significant amount of information and may remain legible even when printed at a small size or etched onto a product. 2D barcode could do much more than just keep track of assets and inventory. Today, 2D codes, especially QR codes, which can hold as much as 7,000 digits or 4,000 characters of text, are used by companies to share information or websites and videos with consumers, or by healthcare facilities to monitor medication, and even to integrate data with programs like MS Office, MS SQL Servers, and other databases and files. 2D barcodes are used in a wide range of industries, from manufacturing and warehousing to logistics and healthcare. Barcodes work through the combination of a symbology (the barcode) and a scanner that can read the symbols and convert them into useful information, often information about an item’s origin, price, type, and location. The scanner reads the barcode and automatically enters the information stored in it into a system – often some type of database. This tool has provided many, many benefits for businesses. It paved the way for the globally connected distribution channels we now have and it is what allows big Departmental Stores like BigBazaar, Walmart, Pentaloon to ensure they have products properly stocked and priced around the stores located in all cities. It has also become a crucial tool to help small and medium businesses, as well as hospitals and government groups, keep track of assets and improve their efficiencies. Keeping track of inventory. A basic inventory tracking system consists of software and a barcode scanner or mobile computer. Inventory items (like products you sell, supplies, or raw materials) will all have barcode labels, so when you remove an item from stock, you just scan the barcode to reduce the available count in your inventory tracking software, instead of having to type in a SKU. Keeping track of assets. Any business, no matter how large or small, has IT assets and fixed assets. Barcoded asset tags are attached to each individual asset, and can be scanned to check items in or out in your asset tracking software. It’s a great way to improve accountability and makes audits much easier. Use barcodes in return mail. Add a barcode to the return-mail registration postcard that matches the product’s serial number, and then you can instantly track which serial numbers are registered, and which aren’t. Plus, your customers won’t have to locate and transcribe a lengthy serial number. Include barcodes in a mail merge. If your company is hosting an event, you can add barcodes to an RSVP card so you can track who has responded – without trying to translate anyone’s handwriting. Add barcodes to invoices. Add a barcode that represents the customer number or the individual invoice number so when it’s returned with payment, you can easily locate the customer account or invoice number. This will prevent problems like applying payments to the incorrect customer account or invoice. Why do you need FinTaxx Corporate Professional's service for Barcodes registration? Our Consultants possess deep exposure in Barcode registration service and helps entity to get their barcodes issued smoothly from GS1 India. Is FinTaxx Corporate Professional works in pan India for Barcodes Registration? When barcodes are used in the business process, procedures are automated to increase productivity and reduce human error. Whenever there is a need to accurately identify or track something, bar-coding should be used. For example, in a data entry work environment, workers may be required to enter an enormous amount of data into a customer database system. Instead of manually typing a customer identification number into a database, if the information is contained in a barcode, a data entry operator may scan it in. This would increase automation and reduce human error. Where did the barcode system come from? The 12 digit UPC bar code system was designed in the early 1970’s by George J. Laurer in the USA (when he was working as an engineer for IBM). A few years later he developed a 13 digit version of this code – the EAN-13 code – for use internationally (outside of the USA). How can I obtain barcode for my products? Talk to our Consultant on call or Email at info@fintaxx.in to know the process, Pricing etc. Will the barcode number I receive be unique? Yes. Your codes are guaranteed to be unique for your products. All barcodes have originated from GS1 and come delivered with an included certificate to guarantee their authenticity. How to Choose the best barcode type to use? Determining the best type of barcode to use depends on the environment, requirements, application, and printer. EAN-13 barcode numbers are 13 digits long. They are the most common type of barcode for retail products in India (as well as worldwide). In the USA, the 12-digit UPC code is preferred. Almost all barcode scanners are able to read both types of code. Why do I need to get a barcode? The majority of retail stores today are using a barcode system (and many more will implement a barcode system in the near future). Therefore we recommend that you get a barcode if you want to sell your product in retail stores. You may also need a barcode if you want to sell your product online (stores such as Flipkart or Amazon require your product to have a barcode). Can I get a UPC-A barcode (instead of an EAN-13 one)? Yes, you can – just let us know what you want when you make your order. We normally provide barcodes in EAN-13 format because this is the most common format used in India – however we are happy to supply your barcode to you in UPC-A format instead (or as well), if you prefer. UPC barcodes are 12 digits long, and are used mainly in the USA. EAN barcodes are usually 13 digits long, and they are used all over the world. Most barcode scanners can read both types of barcode. How many barcodes do I need? It is usually necessary to have a different EAN-13 barcode for each different product variation (each different size, colour, design etc). Certain products, such as greeting cards or post cards, sometimes use just one barcode number (although often with a 2-digit supplement at the end – ie. EAN13+2 format). Will my Barcode work on any retail product? Yes. 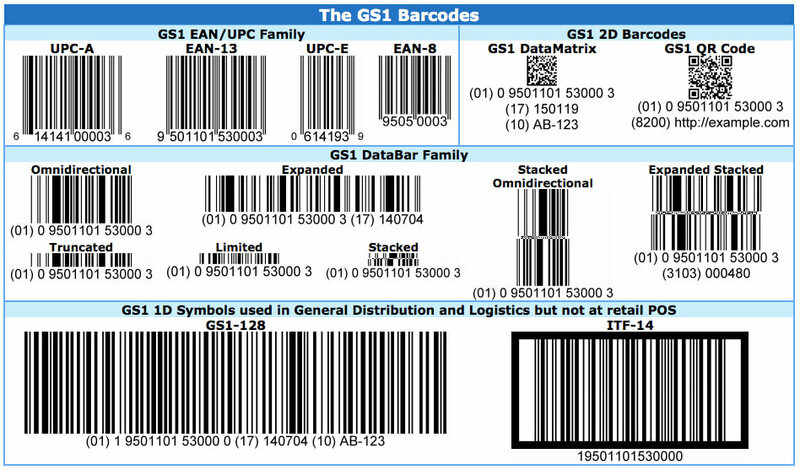 GS1-origin barcodes that are unique worldwide. They are suitable for use on any retail product (although if you have a book or magazine you might want to get an ISBN or ISSN number instead). What should I do next after I receive my barcode? You can begin using your barcode straight away – just attach it to your product, and then give your product to your retailers. They will enter your barcode number & product information into their system. After that, when your retailers scan your barcode the product information will appear on their screen. Do I have to be a registered company to order a barcode? No, you do not have to be a registered company to purchase a barcode. Any individual, organisation, or group can purchase a barcode from our company. What Barcodes are needed for books? Books need an ISBN number. You need to get one of these numbers assigned to your publication. What Barcodes are needed for magazines? Magazines need an ISSN number. You need to get one of these numbers assigned to your publication. What is a Global Location Number (GLN)? A GLN is a globally unique number which is used by some retailers as a location identifier for suppliers.